Last edited by cktuba on Thu Feb 14, 2019 10:20 am, edited 1 time in total. If Ed thought it was worth an entire chapter, that might get you started. Look at the examples of what he expected the student to play on the mouthpiece. I've pointed out before, here, that its a different thing - face-wise - from playing an instrument, and have also discovered that pointing this out "triggers" few players. It's certainly (not to me, anyway) worth discussion (argument? ), particularly as I'm not a teacher - and am not responsible for the progress/advancement of other individuals. I would say, then (which is redundant, as all people do this anyway), "Do as you wish." Last edited by bloke on Thu Feb 14, 2019 10:09 am, edited 1 time in total. Free-buzzing and tuba playing are two completely different things. Free-buzzing requires far more muscle recruitment since you are lacking any sort of resistance provided by a tuba;mouthpiece and as such, the mechanics are different. To me it is just overtraining that can lead to poor mechanics when you actually pick up the horn. Arnold Jacobs was a devoted advocate of mouthpiece practice, but warned his students to avoid free buzzing. He always said that there are basically two types of fibers in lip muscles of the embouchure. The large muscles that run more or less horizontally across the upper and lower lip form the obicularis oris. These muscles are large and quite powerful compared to the smaller muscles that run more or less perpendicular to the obicularis oris, forming what he called a basket weave pattern. These smaller muscles are responsible for the shaping of the lips through retraction, protraction, elevation and depression. In order for them to function properly, Jacobs said that they needed to be isolated inside the cup of the mouthpiece through the slight pressure of the rim against the lips. If there is no mouthpiece, then these muscles are not properly isolated, and will not respond in the same manner as when we play with a mouthpiece or a rim. The result can be that the large muscles of the obicularis oris can become over developed, interfering with the function of these smaller muscles. This is a problem since they smaller muscles are responsible for the shape changes necessary to allow the lips to vibrate at different frequencies. Now, there are some Jacobs students that advocate free buzzing, including Gail Williams and Pat Sheridan. But they seem to have indicated that just because it worked for them does not mean it is beneficial for everyone. When Sheridan told Mr. Jacobs that he did some free buzzing, Jacobs asked him why and how much. Sheridan said he only did it for a few minutes a day, and specifically to work on isolating and firming up his corners, which was something Jacobs had suggested he needed to work on. Sheridan said he did a little every day, focusing on firm corners, and them went on with his normal practice routine. Jacobs seemed satisfied with his answer and allowed him to continue since he was deriving a benefit and it was not harming his playing in any other areas. So, in small doses, with a specific objective in mind, it does not appear to be harmful, and could have some benefit. But buzzing on a mouthpiece or a rim is probably a better practice method for most players. Below are interviews with Pat Sheridan and Gail Williams discussing their studies with Mr. Jacobs. happyroman wrote: Arnold Jacobs was a devoted advocate of mouthpiece practice, but warned his students to avoid free buzzing. He always said that there are basically two types of fibers in lip muscles of the embouchure. The large muscles that run more or less horizontally across the upper and lower lip form the obicularis oris. These muscles are large and quite powerful compared to the smaller muscles that run more or less perpendicular to the obicularis oris, forming what he called a basket weave pattern. These smaller muscles are responsible for the shaping of the lips through retraction, protraction, elevation and depression. In order for them to function properly, Jacobs said that they needed to be isolated inside the cup of the mouthpiece through the slight pressure of the rim against the lips. Thanks for sharing those interviews. I have them marked in my "watch later" list. We hear so much about what Jacob taught third or fortieth hand, I'm eager to hear a more direct conversation with an accomplished student. Pat Sheridan is by far the most impressive tubist I've heard in person. I bolded a statement for myself to think about. Not looking for an answer, just thinking out loud, does even a mouthpiece as large as a tuba isolate embouchure muscles within it? Clearly trumpet and trombone do not, and that may be why they derive so much benefit from freebuzzing, if true. There is plenty of contribution from cheek and chin, good and bad. His thought seems to be that if smaller muscles are not isolated then larger ones must be activated for pitch change, and that isn't necessarily true. Much pitch change on trumpet and trombone when freebuzzing can be done with tongue position, and it can be a method to build that skill. And now like bloke I'll disappear. I don't care if anybody else freebuzzes or not. I do, briefly and for specific purposes. I take "isolate" to mean that rim support accomplishes something that would otherwise depend on surrounding muscles - obicularis oris etc. When the smaller inner muscles are the only ones that have anything to do, they operate in isolation, and it is in that sense that the mouthpiece isolates them. Not by blocking them. So for this function, the mouthpiece just has to be big enough to support the embouchure, while allowing the smaller muscles to work. I'd rather spend my time playing a tuba. Stryk wrote: I'd rather spend my time playing a tuba. So long as one is handy, yes!! To date, no one has paid me to "free-buzz". I could imagine some masochists out there, but I would rather not imagine them. bloke wrote: To date, no one has paid me to "free-buzz". You mentioned hanging with Doug Elliott in a previous thread. Have you seen him free buzz? Astonishing. Naturally, he's an advocate for a number of reasons. That said, he doesn't recommend free buzzing below Bb at the top of the bass staff, so perhaps it would be of limited use to most tuba players. 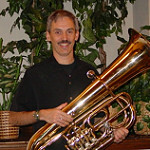 I use freebuzzing extensively in my teaching, including for tuba. Bb on top of the staff is a very easy note for most people to buzz, whether it's a low C on trumpet, middle Bb on trombone, or high Bb on tuba makes no difference. The formation and usefulness is the same. And no, I didn't show it to Joe. If you think my buzzing is astonishing. I now have videos, both front and side views, of Clayton Capps in Texas who can freebuzz more than 4 octaves with what I would consider perfect form. I may post it on YouTube. And it's not just a trick, he also sounds fantastic on the instrument. For those advocating its use, what is the perceived benefit of free-buzzing? Doug Elliott wrote: If you think my buzzing is astonishing. I now have videos, both front and side views, of Clayton Capps in Texas who can freebuzz more than 4 octaves with what I would consider perfect form. I may post it on YouTube. And it's not just a trick, he also sounds fantastic on the instrument. What I have found is that some people can free buzz low notes but when the mouthpiece rim suddenly cuts off part of the free-buzzing aperture, the person cannot play those notes on the instrument because the free-buzzing embouchure doesn't know how to do the pitch with that limit in place. To me, an embouchure is an embouchure and different cup sizes have to do only with being able to accommodate the buzzing part to the width of the cup. So for some people changing from, for example, trumpet to tuba, causes extreme mayhem. Some learn to overcome that (with practice, for sure) and others seem to have extreme difficulty.